Multiple Rules in Conditions to SKIP pages. I am migrating over from forms central and having problems with logic. Is there any way to add the logic to the next button based on the answer in a previous page without affecting the logic already set in that previous page? Now from page 11, I want them to skip to page 13 based on Page #5 answer is no else I want them to skip to page 12 after completing page 11 based on Page #5 answer is yes. I was able to set logic to each next button of a page without it affecting other conditional statements. You can do that by adding more rules to require skipping to next pages. 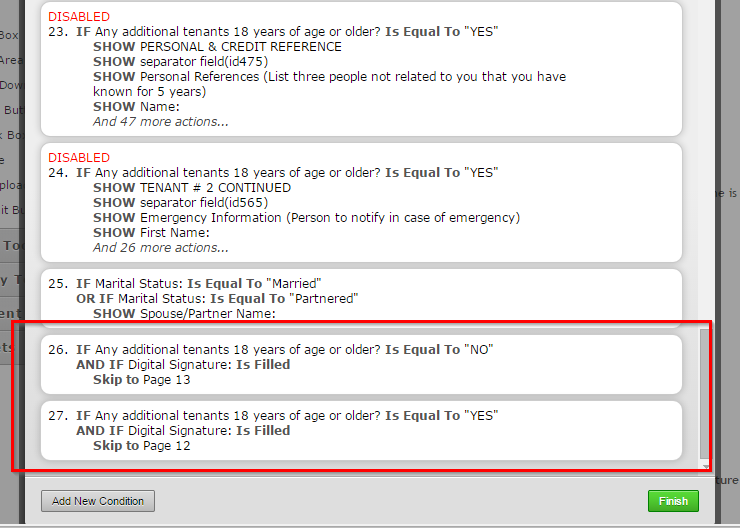 Page 5 if tenants age is 18years and older is "Yes" SKIP to Page 11. Page 11 if tenants age is 18years and older is "Yes" ( based from page 5) AND digital signature (page 11) is Filled then SKIP to Page 13. Page 11 if tenants age is 18years and older is "No" ( based from page 5) AND digital signature (page 11) is Filled then SKIP to Page 12.